Stamp topics can be packed with interesting happenings which occasionally do not make sense at first glance. In my Russian album I have three stamps which I found to be catalogued under Czechoslovakia. It turns out that the stamps were issued for local use by Czechoslovakian troops in Siberia, but what on earth were the Czechs doing having an Army Outpost in Siberia in 1919 months after the war’s end? At the beginning of the First World War Austria conscripted large numbers of Czechs to fight on the Austro-German side even though the majority of Czechs sympathized with the Allied cause. The outbreak of war in 1914 revived dreams of the Czechs gaining their independence, free from the yoke of the Austrian Empire under which they had existed for 300 years. Czechs in exile began demanding their own country from the allied command as their price of support and it appeared the state would become a reality at war’s end. By 1918 many Czechs living outside the Austro-Hungarian Empire and elsewhere had joined the Allied cause led mainly by France, Great Britain, its colonies, the United States, and a number of other European countries. Following their capture on the battlefield by the allies many Czechs volunteered to change sides and fight against the Austrians, Germans and Russians. With the vast growing numbers they were formed into battalions in France, Italy and Russia, later reformed into legions in Russia but were never deployed by the Provisional Government following the forced abdication of the czar. The new Russian Bolshevik government on seizing power, quickly signed a treaty and made peace with the Germans which left the Czech Legion isolated and alone in Siberia. Bitter fighting on the Western Front resulted in a proposal by the Czech leader Masaryk, who later became first president of Czechoslovakia, to transfer the Russian Legion to France. However the war barred the way westward towards France from their Ukraine headquarters. It was decided to send the army through to Vladivostok and France via the strategic 5,000-mile-long Trans-Siberian Railway. The Legion, now numbering between 700,000 and 100,000 men and all equipment, set off eastward in the spring of 1918 but encountered hostilities from local Bolsheviks culminating in a decision to seize the railroad and fight their way out. Forming an alliance with White Russians in the area they took control of the railway. As the war dragged to its conclusion in November of 1918 the Czech army remained in Siberia. Much concern was expressed in the new state of Czechoslovakia whether to bring them home quickly or push for an all-out fight against the Bolsheviks and the threat of communism. After defeat of the White Russian army in the summer of 1919, the Legion’s commanders decided to drop their support, and concentrate on guarding the Trans-Siberian railway until allied ships could reach Vladivostok to rescue them. They were able to hold on to their support base until April of 1920 before finally departing for home. A force of United States troops dispatched to Siberia in September 1918 to rescue and support the Czech legion was defeated by the winter weather and was unable to establish a solid front. Following a huge outcry from home the expedition was withdrawn in May, 1919. During their occupation of the Trans-Siberian Railway the Czech Legion maintained an active goods delivery service, produced daily newspapers, carried mail first for their own troops and later included the civilian population. The 5,000-mile-long Trans-Siberian Railway links the port city of Vladivostok with the inland city of Omsk. For mailing purposes on the railway they produced three main issues of stamps. The first was a Russian 10 kopek definitive released in November 1918--a very rare stamp. The second group from 1919-20, consists of three stamps. A 25 kopek (scarlet) depicting an Irkutsk church located about mid-point between Omsk and Vladivostok; an armored train named 'Orlik' (the armor so necessary on the train) is shown on the 50 kopek (green); while a sentry, many of whom were employed on the lengthy project, is seen on the one ruble (red-brown) stamp. According to an information sheet each stamp was copied six times for the lithographic plates and contain minor differences which can be identified by experts. The one ruble was printed in sheets of 105 (7x15) while the other two comprised of 120 per sheet. It seems there was a wide variety of different glues used, due possibly to having been added at a later date and at different locations. Most ‘used’ stamps were ‘cancelled-to-order.’ Genuine used stamps command a premium. Scott’s catalogue posts only one price, presumably for mint stamps. Other stamps include a series of five essays printed for the pictorial issue in various colors and shades showing a sentry in front of a tree, an armored train rounding a sharp curve, a sentry on one knee shielding his eyes, two soldiers warming themselves in front of a fire, and a sentry similar to the earlier one ruble stamp. Quantities are not specified. 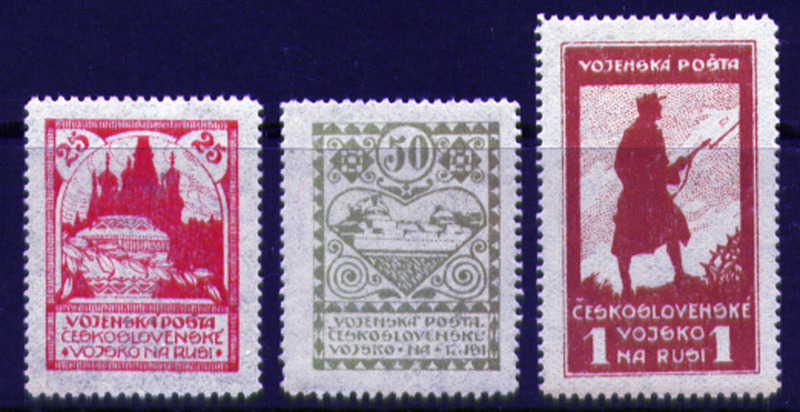 Czech stamps printed for the Trans-Siberian Railway system.